Oil-painted portraits of noble or wealthy men and women became increasingly common in the 17th century. Important as it was to dress magnificently, it was also essential to be portrayed in one's finery. The portraits nearly always show the sitters splendidly dressed, in the height of expensive fashion, in order to emphasise their status. Margaret Layton (formerly Laton) was the daughter of Sir Hugh Browne, a wealthy vintner and grocer. She is said to have been born in 1579, but it is more likely from her costume and appearance that she was born around 1590. She married Francis Layton (1577-1661), one of the Master Yeomen of the Jewel House at the Tower of London, and died in 1641. The artist, Marcus Gheeraerts the Younger (1561-1635), spent his early years in Bruges (Belgium), where his father was active as a painter and printmaker. When he was about seven, the family moved to London. Marcus eventually obtained many commissions from the English court, both for portraits and for decorative work. He was popular at the courts of Elizabeth I and James I, but fell out of favour with James's wife, Anne of Denmark, after 1617. After that date, Gheeraerts's sitters came more and more from the gentry. By family descent to Sir John Headlam; sold Christies's 19 July 1929 lot 41, bought Knoedler presumably for Hon. Esmond Harmsworth, later Viscount Rothermere, and purchased by private treaty 1994. Probably painted in London by Marcus Gheeraerts the younger (born in Bruges, Belgium, 1561, died in London about 1635-1636). The painting was acquired with the jacket worn by the sitter, now in the Textiles and Dress Department (museum number T.228-1994). When the V&A acquired the jacket and portrait of Margaret Layton in 1994, the museum used the version "Laton" following the example set in 1933 by V&A curator Albert Kendrick. However, according to documents and monuments of the Layton family in Rawdon, Yorkshire, and The Dictionary of National Biography, the name was more ususally spelled with a 'y'. A member of the Aireborough and Horsforth Museum Society in Yorkshire wrote to the museum in 2002 (letter passed to the Textiles and Dress Department). The letter explained that the Society holds documents signed by Margaret Layton's husband, Francis, all of which are signed 'Layton'. Enclosed was also a copy of a document dated 17 May 1642 and an article on Rawdon, the Layton's estate in Yorkshire. A.F. Kendrick, English Needlework, 1933, p.93. The author was clearly aware of the sale of the portrait and jacket at Christie's (spelt Layton, see below), but no explanation of the change in spelling was given. George Wingfield Digby, Elizabethan Embroidery, 1963, p.82 (includes several errors of fact, citing her maiden name as Rawdon [it was Brown/Brawne] and that she was a Lady-in-waiting to Queen Elizabeth I [no evidence for this, and very unlikely]. Document dated 17th May 1642, signed by 'Fra: Layton' [copy sent to the museum by a member of the Aireborough and Horsforth Museum Society in Yorkshire]. Tombstones of Henry and Thomas Layton, sons of Francis and Margaret, in St. Peter's Church, Rawdon. Portrait of Mrs Francis Layton, sold at Christie's, 19 July 1929, property of Major-General Sir John Headlam, descendant of the Layton family, to Viscount Rothermere. Portrait of Margaret Layton of Rawdon (d.1641), Christie's New York, Saturday, 16 April 1994, property from the Estate of Mary, Viscountess Rothermere. Dictionary of National Biography, entry for Henry Layton, "theological writer, eldest son of Francis Layton (d.23 Aug. 1661, aged 84) of Rawdon, West Riding of Yorkshire, was born in 1622. His father was one of the masters of the jewelhouse to Charles I and Charles II." Online New Dictionary of National Biography, entry for Henry Layton (1622-1705), "writer on theology, was born at Rawdon, in the West Riding of Yorkshire, the eldest of the six sons of Francis Layton (1576/7-1661), master of the jewel house to Charles I and Charles II, and Margaret, daughter of the well-known benefactor Sir Hugh Brown of London. The Laytons were an ancient and well-to-do family, and in pursuance of his father's will, Henry built a chapel at Rawdon." In the absence of any evidence for the use of 'Laton', it is difficult to argue against the signature of her own husband, the tombs of her sons and the DNB entries. Historical significance: Avril Hart and Sharon Fermor, entry no. 4075 on Jacket of Margaret Laton [sic] and Portrait of Margaret Laton [sic], in National Art Collections Fund Review, 1994, p.146-147. "The portrait of Margaret Layton, purchased with the bodice, is an intriguing example of early seventeenth-century English portraiture, as well as a unique example of a sitter shown wearing an extant garment. Comparison with the bodice shows that the artist has painted its distinguishing features with great care, undoubtedly reflecting the value that it held for the sitter. He has paid particular attention to its embroidery, reproducing in detail the individual motifs of birds, insects and flowers, while exercising a degree of artistic licence in terms of their specific arrangement. The portrait has not yet been securely attributed to a known artist, although in some respects it shows similarities with portraits by Marcus Gheeraerts the Younger (c.1561-1636), who worked for the Crown from the 1590s onwards. 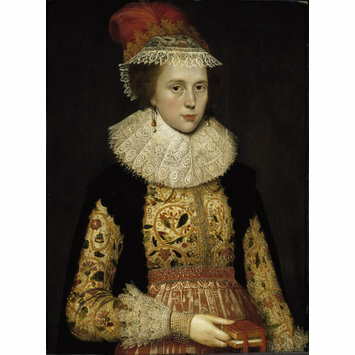 Female portraits ascribed to Gheeraerts at Hampton Court and at Dulwich Picture Gallery [London] show sitters wearing similarly embroidered jackets and the handling of detail is close in each case, although one cannot rule out the possibility that this reveals the hand of a specialist painter of costume. The facial type of Margaret Layton and the sketchy painting of the hair also occur in other Gheeraerts portraits. The relative informality of Margaret Layton and the lack of background detail are, however, uncharacteristic of the artist, although they may have been specified by the patron. The date of the portrait is unknown, but the style of the bodice suggests a date of between 1610 and 1620. The sitter's age at this time is also uncertain, but X-radiographs of the painting reveal that the artist produced two versions of the face. Beneath the visible likeness is an older-looking, slightly heavier image of Margaret Layton's face. It would thus appear that the artist repainted her in a more youthful and idealised way, perhaps at her request, or that of her husband who was most likely to have commissioned and paid for the work. This alteration raises interesting questions, at present unanswerable, about the exact date of the painting and the occasion for which it was commissioned. 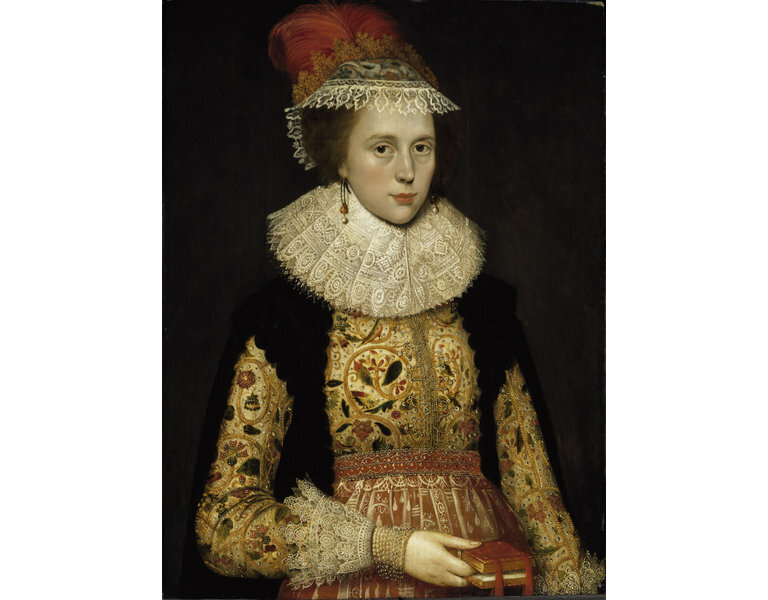 The size and plain setting of the work and the relative informality of the sitter's costume make it unlikely that it was designed to commemorate a great public occasion, although the painting is not without its own quiet grandeur. Certainly, the sitter is shown as a model of propriety, with her eyes slightly averted from the viewer. The small open book in her hand is probably intended to suggest a missal, a device which portraitists often used to allude to the sitter's presumed piety. SF. Sharon Fermor is Head of Paintings in the Prints, Drawings and Paintings Collection at the Victoria and Albert Museum." Christie's New York, Saturday, 16 April 1994, property from the Estate of Mary, Viscountess Rothermere. Therle Hughes, "Six Centuries of British Needlework", Country Life, March 5, 1959, p.456-7. Illustrated Fig 2., with Jacket, Fig. 3. Susan Mayor, "The Layton Doublet", in The collection of Mary, Viscountess Rothermere, Christie's International Magazine, Vol XI, no. 2, March/April 1994, p.14. Avril Hart and Sharon Fermor, entry no. 4075 on Jacket of Margaret Laton [sic] and Portrait of Margaret Laton [sic], in National Art Collections Fund Review, 1994, p.146-147. For citation of part of this article by Sharon Fermor referring to the portrait, see "History". This painting was acquired along with the actual jacket the sitter is wearing. It is an extremely rare - perhaps unique - case of a portrait surviving for more than 350 y ears together with part of the costume worn by the sitter. Both the portrait and jacket remained in the family collection until they were sold at auction in 1929 to the Hon. Esmond Harmsworth, later the 2nd Viscount Rothermere. The V&A purchased both from the Rothermere estate in 1994. Margaret Layton was the fourth daughter of Sir Hugh Browne (or Brawne); he was a wealthy vintner and grocer, of Newington Butts, Surrey (a district now known as the Elephant and Castle), who was knighted in 1603 when he was 66 years old. Margaret is supposed to have been born in 1579, although it seems more likely that her date of birth was around 1590. She died in 1641. She married Francis Layton (1577-1661) of West Layton and Rawdon, West Yorkshire, who served as one of the Master Yeomen of the Jewel House for Kings James I, Charles I, and briefly after the Restoration, Charles II. They had two sons and four daughters, the eldest son Henry being born in 1622 and achieving fame as a theologian; he died in 1705. Margaret may have been a Lady-in-Waiting at the court of Elizabeth I, although there is no evidence to support this supposition. This portrait shows here as a young woman, surely not much older than thirty years of age. 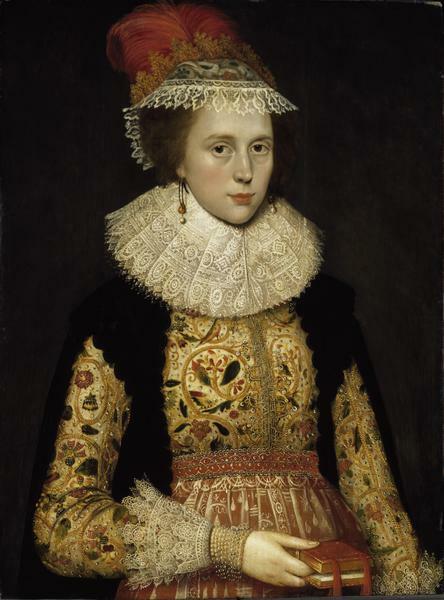 The style of Margaret Layton's clothes may be dated to the early 1620s, particularly because of the high-waist and the form of the lace ruff. She is wearing a skirt with an apron, an open gown with hanging sleeves, and a full complement of accessories: plumed cap (otherwise known as a cornet, or shadow), falling lace ruff and matching cuffs, eight-chain bracelet of matching pearls at her wrist, and ear strings each with a pendant ruby and a pearl. But the most magnificent component of her ensemble is the jacket. It is made of line, lined with pink silk taffetta, embroidered in coloured silks, silver and silver-gilt threads, and spangles forming a curvilinear pattern containing richly detailed plants, fruits, flowers, animals and insects. This kind of embroidered jacket was fashionable between about 1600, and more probably 1605, and 1620. The 'conspicuous consumption' of the later Elizabethan court is still evident: much of the spectacular embroidery on the jacket is hidden by the robe and the apron.